I am on a mission to identify all the trees I have in my garden and on my property. For a novice like me thats not an easy task because … well where do I start? I have taken photos and trawled through books and web sites and just when I think I have one, I see another photo and realise I might be wrong. So I am waiting for my tree-feller guy to come in March to help me with this. This one was easy to identify because of the “fruit” it drops. 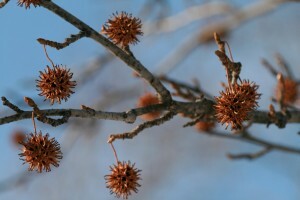 It’s an American Sweetgum or Liquidambar styraciflua. The American Sweetgum is a popular ornamental tree which is grown for its intense autumn colors. To me, the tree is beautiful all year round, but I do agree that it is quite spectacular when the leaves change colour in Autumn. It was easy to identify from its combination of five-pointed star-shaped leaves and spiked fruit. I’m forever picking these up off the ground (see the second photograph). Liquidambars are large, fast-growing trees that can reach 25 metres (82’) high and spread to around 12 metres (39’). Although liquidambars are beautiful trees, they do have strong, aggressive root systems. 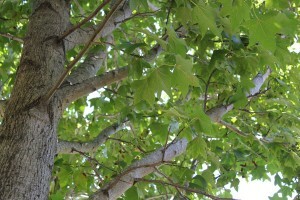 If a liquidambar is planted too close to storm water pipes, the root system may completely clog the pipes. I also have a liquidamber and it is the most beautiful tree in my garden. However, I am a little concerned about the roots. Do you have any idea what root system they have? I’m starting to get the impression that the originalk owners of this erf / property were Americans, what with all the native American trees in my garden. Yup – this tree was also in our back garden when we lived in the USA as kids. We used to make christmas decorations with the dried spiked fruit. Nice to know the name of it! Such a beautiful, shady tree. I also love trees – old trees!